When you open JPEG images and save back to a JPEG format, you’re adding file compression to the saved images. JPEG is a lossy file format, which means that you lose image data when you save in this format. If you edit a JPEG image many times and save back to JPEG format each time, you continually lose more image data. In some cases, you may want to convert multiple JPEG files to a file format that doesn’t toss away data. You can use formats such as Photoshop PSD, PNG-24, or TIFF (without JPEG compression), and no data are thrown away when you save the file. For a single instance when you want to convert a JPEG image to a PSD or TIFF image, you can open the file in Elements and choose File→Save As. From the Files of Type drop-down list (Windows) or Format pop-up menu (Mac), choose the desired format. You should have a collection of photos in the Organizer saved as JPEG or some other format that you want to convert to a newer format. Select files in the Organizer you want to convert. Click a file and press Shift and click the last file in a group, or you can click and press Ctrl and click all the photos you want to convert. Choose File→Export as New Files. The Export New Files dialog box opens. Select a File Type option. If you’re converting JPEG files, you might want to choose PSD for the file format. This format does not compress files. Select a Size and Quality. 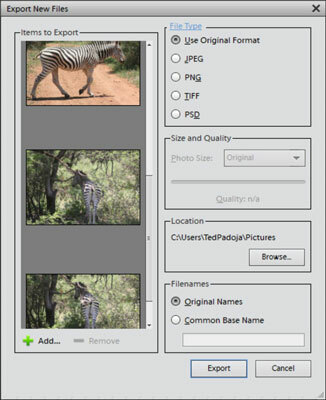 Select Original if you want to maintain the same image dimensions and resolution. If you want a different size for the saved images, make a choice from the Photo Size drop-down list. Click the Browse button in the Location area. You can target a folder on your hard drive if you don’t want to use the default folder shown in the Export New Files dialog box. Select an option under Filenames. You can save the files to a new folder with the same names without overwriting the original files or save to the same folder adding a common base name. If you select the Common Base Name option, you can type a base name in the text box. Type something like Hawaii, for example, and the files are saved as Hawaii001, Hawaii002, and so on. Click the Add or Remove button to add more files or remove some from the list, respectively. If you want to add more files, click the Add plus (+) icon. You can scroll the list of thumbnails, and if you find photos you want to remove, click the respective photo and click the Remove minus (–) icon. Wait for the progress to complete before moving on. After the export progress finishes, the Exporting Files Complete dialog box opens. The file export task is completed.